If you’re a fan of all things sweet and savory, do I have a cookie for you!!! I found this recipe in the December 2012 edition of Food Network Magazine and I immediately knew I had to make them. They did not disappoint. They’re so, so, so good! I didn’t follow their directions exactly (big shocker) but I think they turned out pretty exceptional, if I do say so myself. -Add the pretzel sticks into a zip lock bag and crush into coarse crumbs. Set aside. -In a large bowl, beat the butter and sugar until fluffy. -Mix in the egg yolks, honey and vanilla. -Blend until combined, scraping down the sides of the bowl to thoroughly incorporate. -Place the crushed pretzels in a small bowl and once you’ve rolled the cookie dough into balls, roll the cookie balls into the crushed pretzels (you may need to gently press the pretzels into the dough to get them to stick). -Place the pretzel cookie balls evenly on a parchment lined baking sheet (12 per sheet) leaving a few inches between each ball. -Gently press your thumb into the center of each cookie to form a small well. -Bake the cookies for approximately 18-20 minutes, rotating the cookie sheets half way through the baking. -Remove from the oven and, if needed, use a teaspoon to re-indent the well in the center of each cookie while they’re still warm and pliable. -Allow the cookies to cool completely on a wire rack. 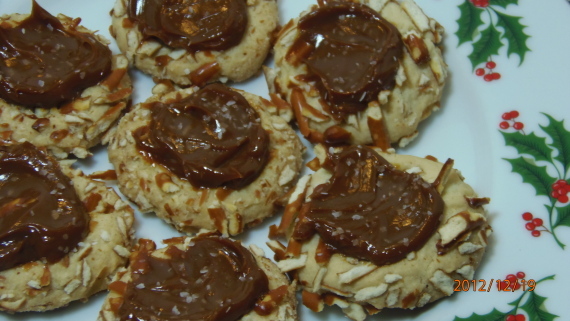 -Once fully cooled, add a dollop of dulce de leche into the center well of each cookie. -Sprinkle lightly with salt and you’re ready to serve. These are seriously good cookies so don’t save them for making just around the holidays. I think they’d be welcomed year round by one and all!!! 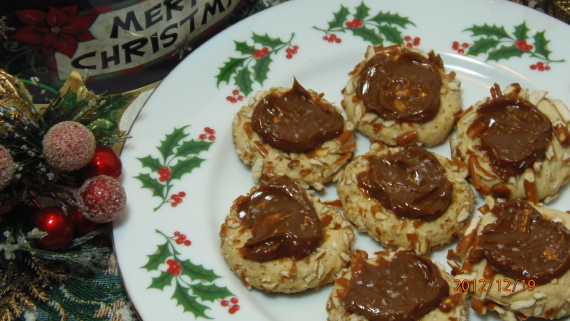 I'm loving that generous dollop of dulce de leche you put on these cookies. I'd eat these year round for sure!